To start sending out emails with Pegasus Mail it’s necessary to configure your SMTP settings – that is, tell Pegasus Mail which outgoing server it must rely on to deliver your messages. 1. 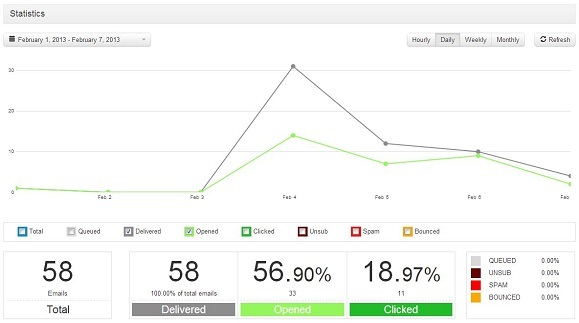 Open the mail software and click on “Tools -> Internet options”. 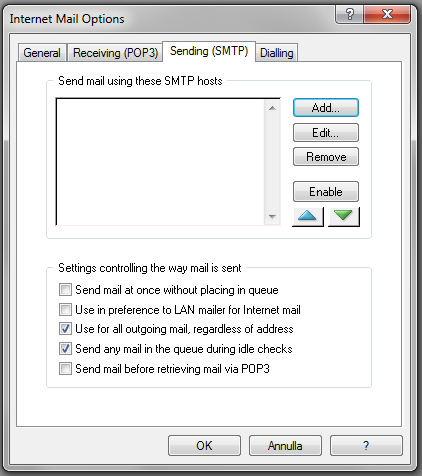 On the popup window, choose the “Sending (SMTP)” tab. Enter a name or a definition: enter a common name for your SMTP server. Server host name: enter your actual SMTP host name: if you don’t know it, here’s a handy list of the most common ones. It’s important to remember, anyway, that if you are setting up a bulk email campaign and need to send out a certain amount of newsletters with Pegasus Mail, you should definitely opt for a professional SMTP service that will ensure the highest deliverability. Moreover, turboSMTP, will provide advanced statistics to understand its efficiency (monitoring click rates, open rates etc.) and allow you to set an automatic unsubscribe link. Server TCP/IP port: the default port is 25, but there are other options. Timeout: set it on 30 seconds. Use an alternate email address for the SMTP envelope: flag it only if you want to use another email account for your SMTP envelope – only for the ones who know what they do! Use this domain in the HELO/EHLO server greeting: the HELO/EHLO server greeting is the welcome exchange between SMTP servers. Again, it’s an advanced option that should be considered only by skilled users. 4. Then click on “Security” tab. SSL/TLS settings: this section will let you send encrypted emails to protect their contet. 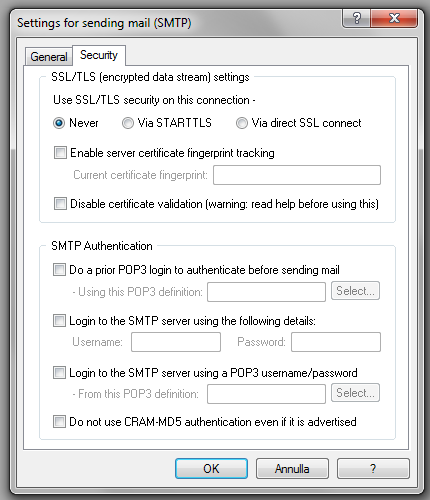 You can choose among STARTTLS or SSL – the two most common protocols – and to enable server certificate fingerprint tracking and disable certificate validation (only for advanced users). SMTP Authentication: there are several ways to send authenticated emails. You can choose to protect them with username and password (the most common alternative), or to set a POP3 authentication or login (here’s more info about SMTP and POP3). We suggest not to flag the final box concerning CRAM-MD5, unless you’re a skilled user.